When, three decades ago, Alex Werner began work at the Museum of London, one of his first jobs was to catalogue some salt-glaze stoneware pottery. It was to be the start of a love-affair with the art pottery made in Vauxhall by the firm of Doulton. The affair continues to this day, and Alex Werner, now MoL’s Head of History Collections, will be on hand to tell you why at a get-together on Tuesday 6 September 2016 to mark the formal launch of vauxhallhistory.org. “My talk will examine the rise of one England’s greatest pottery manufacturers, Doulton. The story centres upon Lambeth and its waterfront in the 19th century, and explores how the energy and vision of Sir Henry Doulton led to the creation of a pottery empire whose products sold throughout the world. The foundation of the business was built on salt-glaze stoneware, a very strong and hard-wearing material, which was made into utilitarian items such as sewers as well as art pottery. A special focus will be upon the Lambeth School of Art and the Lambeth Studios at the pottery which employed hundreds of women artists and decorators. My interest in Doulton pottery began in the early 1980s when I started work at the Museum of London. One of my first jobs was to catalogue some salt-glaze stoneware pottery in the collection. There were quite a number of pieces made by Doulton’s and this led me to research the pottery and especially its relationship with the Lambeth School of Art. My interest was triggered when I came across some very unusual Doulton vases which seemed to date from the late 1860s, the period when Doulton’s first began to produce what became known as ‘art pottery’. Selection of three blue glaze stoneware jugs. 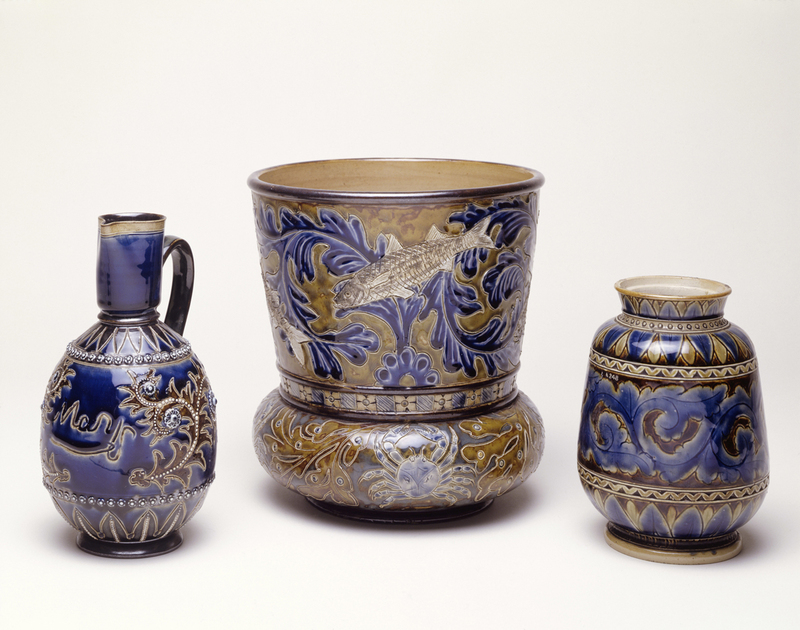 On the left is a stoneware jug by George Tinworth, decorated with a blue glaze and a foliate decoration which is incised and applied. This sample is Inscribed “Mary” and was inscribed by Queen Mary when she was 12 years old. A silver colour has been applied to the base of the neck and base. In the centre is a flowerpot glazed green and brown decorated with marine subjects. Stamped on the base ‘Doulton Lambeth’ and ‘1881’, and inscribed with a monogram of one horizontal line with three vertical lines incised across it. On the right is a jar decorated with a band of foliage in blue on a dark brown background. The decoration is incised and applied. On the base is stamped ‘Doulton Lambeth 1874’ and inscribed with a monogram ‘EJE’ which stands for Emily J Edwards. One of the most gifted students of the Lambeth School of Art intrigued me. His name was George Tinworth, the ‘Tinworth’ in Tinworth Street, Vauxhall. He came from a very poor family who lived in Walworth and was to become a celebrated sculptor. Tinworth struggled to gain any kind of formal education and in his unpublished autobiography he writes of how he sometimes used to pawn his Sunday coat to pay his fees at the Lambeth School of Art.Such was Tinworth’s amazing artistic talent that the school Principal, John Sparkes, managed to get him work at Doulton’s. As Tinworth’s reputation as a ceramic artist grew in the 1870s and 1880s so too did Doulton’s as its ‘art pottery’ became famous through displays at international exhibitions around the world. Another side of Doulton’s business that interested me was its links to the ‘sanitary revolution’. Sir Henry Doulton, the owner of the pottery, pioneered the general use of sewerage and drainage pipes made of stoneware. Previously they had been made of elm wood. Inspired by the reports of the sanitary reformer Edwin Chadwick, Sir Henry established at Lambeth what became the first factory devoted exclusively to the manufacture of stoneware pipes and conduits. vauxhallhistory.org is supported by The Vauxhall Society, and the launch get-together is on Tuesday 6 September at Tate South Lambeth Library, 180 South Lambeth Road, beginning 7pm (doors open 6.45 pm). Entrance is free, and refreshments are available. A donation to the funds of the Friends of Tate South Lambeth Library is welcome. Alex Werner will be joined by David Coke, historian of Vauxhall Gardens, who will discuss the predecessors of Vauxhall Bridge as well as the recent discovery of some rare 19th-century Vauxhall Bridge Company share certificates. Also joining us is writer Naomi Clifford (aka Naomi Lourie Klein), whose latest book The Disappearance of Maria Glenn is a ‘true-life Regency mystery’ with a local flavour.